For other uses, see Massacre (disambiguation). 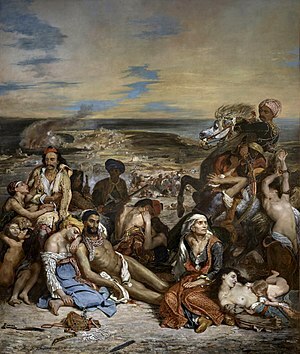 Le Massacre de Scio ("The Chios massacre") of tens of thousands of Greeks in 1824 (painting by Eugène Delacroix). A massacre is a killing, typically of multiple victims, considered morally unacceptable, especially when perpetrated by a group of political actors against defenseless victims. The word is a loan of a French term for "butchery" or "carnage". There is no objective definition of what constitutes a "massacre". Various international organisations have proposed a formal definition of the term crimes against humanity, which would however include incidents of persecution or abuse that do not result in deaths. Conversely, a "massacre" is not necessarily a "crime against humanity". Other terms with overlapping scope include war crime, pogrom, mass killing, mass murder, and extrajudicial killing. The modern definition of massacre as "indiscriminate slaughter, carnage", and the subsequent verb of this form, derive from late 16th century Middle French, evolved from Middle French "macacre, macecle" meaning "slaughterhouse, butchery". Further origins are dubious, though may be related to Latin macellum "provisions store, butcher shop". The Middle French word macecre "butchery, carnage" is first recorded in the late 11th century. Its primary use remained the context of animal slaughter (in hunting terminology referring to the head of a stag) well into the 18th century. The use of macecre "butchery" of the mass killing of people dates to the 12th century, implying people being "slaughtered like animals". The term did not necessarily imply a large number of victims, e.g. Fénelon in Dialogue des Morts (1712) uses l'horride massacre de Blois ("the horrid massacre at [the chateau of] Blois") of the assassination of Henry I, Duke of Guise (1588), while Boileau, Satires XI (1698) has L'Europe fut un champ de massacre et d'horreur "Europe was a field of massacre and horror" of the European wars of religion. The French word is loaned into English in the 1580s, specifically in the sense "indiscriminate slaughter of a large number of people". It is used in reference to St. Bartholomew's Day massacre in The Massacre at Paris by Christopher Marlow. The term is again used in 1695 for the Sicilian Vespers of 1281, called "that famous Massacre of the French in Sicily" in the English translation of De quattuor monarchiis by Johannes Sleidanus (1556),  translating illa memorabilis Gallorum clades per Siciliam, i.e. massacre is here used as the translation of Latin clades "hammering, breaking; destruction". The term's use in historiography was popularized by Gibbon's History of the Decline and Fall of the Roman Empire (1781–1789), who used e.g. "massacre of the Latins" of the killing of Roman Catholics in Constantinople in 1182. An early use in the propagandistic portrayal of current events was the "Boston Massacre" of 1770, which was employed to build support for the American Revolution. A pamphlet with the title A short narrative of the horrid massacre in Boston, perpetrated in the evening of the fifth day of March, 1770, by soldiers of the 29th regiment was printed in Boston still in 1770. The term massacre began to see inflationary use in journalism first half of the 20th century. By the 1970s, it could also be used purely metaphorically, of events that do not involve deaths, such as the Saturday Night Massacre—the dismissals and resignations of political appointees during Richard Nixon's Watergate scandal. The term massacre, being a synonym of "butchery, carnage", is by nature hyperbolic or subjective, primarily used in partisan descriptions of events. There is no neutral definition of what constitutes a "massacre" although some authors using the term may lay down general "working definitions" of what they mean by the term. Thus, Robert Melson (1982) in the context of the "Hamidian massacres" used a "basic working definition" of "by massacre we shall mean the intentional killing by political actors of a significant number of relatively defenseless people... the motives for massacre need not be rational in order for the killings to be intentional... Mass killings can be carried out for various reasons, including a response to false rumors... political massacre... should be distinguished from criminal or pathological mass killings... as political bodies we of course include the state and its agencies, but also nonstate actors..."
Similarly, Levene (1999) attempts an objective classification of "massacres" throughout history, taking the term to refer to killings carried out by groups using overwhelming force against defenseless victims. He is excepting certain cases of mass executions, requiring that massacres must have the quality of being morally unacceptable. Look up massacre in Wiktionary, the free dictionary. ^ "the definition of massacre". Dictionary.com. Retrieved November 24, 2017. ^ Bassiouni, M. Cherif (2011). "Crimes Against Humanity". The Crimes of War Project. Archived from the original on March 20, 2015. Retrieved March 22, 2019. ^ Gallant, Thomas W. (2001). "Review of Levene, Roberts The Massacre in History". Crime, History & Societies. 5 (1). ^ "Massacre". Merriam-Webster.com. Retrieved January 8, 2017. ^ Harper, Douglas. "Massacre". Etymonline.com. Archived from the original on January 8, 2017. Retrieved January 8, 2017. ^ "Massacre". Oxford Online Dictionary. Oxford University Press. Retrieved January 8, 2017. ^ "Massacre". Trésor de la Langue Française informatisé (in French). Retrieved March 22, 2019. ^ Sleidanus, Johannes (1695). De Quatuor Summis Imperiis: An Historical Account of the Four Chief Monarchies Or Empires of the World. Nathaniel Rolls. p. 186. OCLC 11990422. ^ Sleidanus, I. (1669). Sleidani de quatuor monarchiis libri tres. Apud Felicen Lopez de Haro. p. 301. ^ Melson, Robert (July 1982). "Theoretical Inquiry into the Armenian Massacres of 1894–1896". Comparative Studies in Society and History. 24 (3): 482–3. doi:10.1017/s0010417500010100. ^ "Although it is not possible to set unalterable rules about when multiple murders become massacres. Equally important is the fact that massacres are not carried out by individuals, instead they are carried out by groups... the use of superior, even overwhelming force..." Levene excludes "legal, or even some quasi-legal, mass executions". He also points out that it is "...most often ... when the act is outside the normal moral bounds of the society witnessing it... In any war ... this killing is often acceptable." Levene, Mark; Roberts, Penny (January 1, 1999). The Massacre in History. Berghahn Books. p. 90. ISBN 978-1-57181-934-5. Archived from the original on May 10, 2016. Kenz, David El. "GLOSSARY TERM: Massacre". Online Encyclopedia of Mass Violence. Retrieved November 22, 2013. Levene, Mark; Roberts, Penny, eds. (1999). The massacre in history (1. publ. ed.). Providence: Berghahn Book. ISBN 978-1-57181-934-5. This page was last edited on 22 March 2019, at 16:10 (UTC).